Yesterday the full ANCIL team (Jane, Emma, Katy and Helen, with support from John) gave the first in our series of 2012 conference appearances 🙂 We spoke at libraries@cambridge, the annual conference of – you got it – Cambridge libraries. Given that there are over 100 libraries in the University of Cambridge, this is a really useful opportunity to get together for updates, networking and CPD – and it was our chance to introduce the ANCIL research formally to my colleagues at Cambridge. The session was brilliantly live-blogged by Lemurph – you can read her lively and entertaining write-up on the conference blog. For the first time we included our own (re)definition of information literacy. 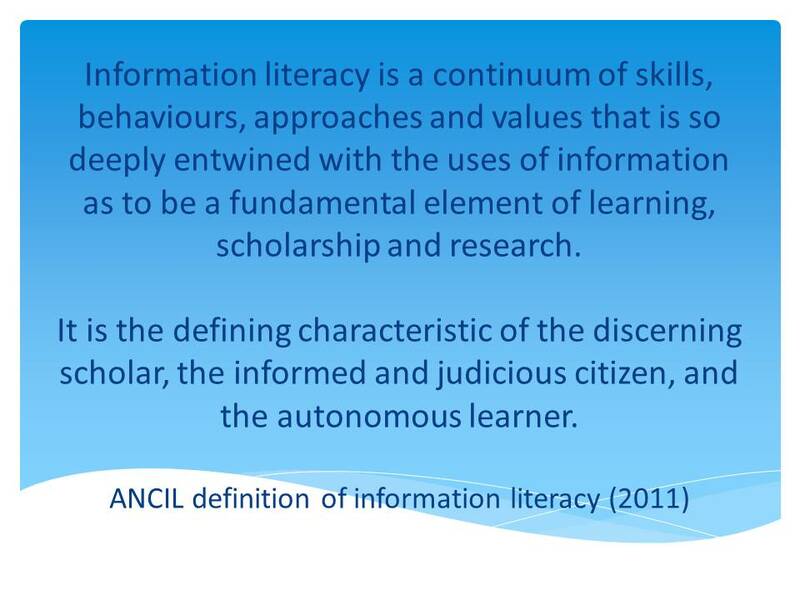 Previously we’ve focused on explaining the 10-strand model and the underlying characteristics that inform ANCIL, and have pointed to the wonderful UNESCO proclamation on information literacy as our working definition. However, our own definition seemed to go down well – and the principles behind it were picked up enthusiastically by an academic speaker later in the conference! This entry was posted in Events and tagged cambridge, information literacy definition. Bookmark the permalink.